How do you create a publicly traded microcap? IPO a small cap and lose a lot of money. Quite a number of microcaps came to be in just this manner. A recent personal acquisition of just such a historical money-loser inspired this article. Some math was required to evaluate what the tax net operating loss (NOL’s) carry forwards might be worth going forward. Factoring such tax advantages into the valuations of companies is rather common, but much more so for microcaps than for larger companies. Large companies, after all, usually didn’t get to be large by losing a lot of money. In the case of my recent acquisition the company has been especially adept at losing money. In fact, the company has tax NOL’s that are roughly 16 times the company’s current market valuation. I figure they won’t be paying income taxes for the next twenty years. What’s that worth? I’ll bet the answer will surprise you. The statutory Federal corporate income tax rate in the United States varies from 15% for lower incomes to a top bracket of 35%. States lay some income tax on top of that and you’ll sometimes see companies report income tax expense as high as 38% to 40% of pre-tax income. The 35% top rate is the highest among industrialized countries but in 2011 the average rate paid by U.S. corporations was a record low of just 12.1%. There were tax benefits from the large losses many companies experienced in the 2008 recession but also R&D credits and special breaks for special industries. The U.S. imposes confiscatory rates and then hands out tax breaks to constituencies favored by the politicians; a recipe for corruption. But this is an investing blog and let me just note that a small successful company without the benefit of NOL’s or political bribes pays significant income taxes. I’m going to use an effective rate of 30% for the calculations in this article. Suppose your company is a no growth company with a pre-tax return on equity of 10% that pays all their earnings to shareholders in the form of dividends. After paying 30% corporate income tax the company earns 7% on their equity and pays all the earnings to shareholders. That’s probably the right thing to do if you’re just earning 7% on your capital. If they have NOL as their friend, they earn 10% return on equity and shareholders earn a much nicer dividend that is 42.8% higher. If those NOL’s could last forever the untaxed company would be worth 42.8% more than the one paying 30% to the government every year. Tax NOL’s generally can be carried forward to offset future income for a maximum of 20 years. That’s a long time, but not forever, so our no growth companies value is enhanced somewhat less than 42.8% by NOL. But what if your company is a growth stock? That is, they earn a high pre-tax return on equity and can reinvest earnings back into the company at the same high return on equity? Are the tax NOL’s worth more? You bet. Let’s compare two companies with a pre-tax ROE of 20% that are absolutely identical except one pays taxes for the next 20 years and the other does not. The book value of the company with the NOL’s in twenty years would increase by the factor (1 + 0.20)20 = 38.33 . The same company paying taxes at 30% each year would have a return on equity after taxes of just 14%. After 20 years the fully taxed company would have increased book value by a factor of (1 + 0.14)20 = 13.74. After 20 years the two companies are again equal in the eyes of Uncle Sam as the NOL’s have expired. However, the company that used their friend NOL is worth 38.33/13.74 = 2.79 times more than their tax-paying counterpart. So you should mark up the value of any company with large NOL’s with 20-year expirations by a factor of almost three? Not so fast. First the valuation markup depends a lot on the return on equity. Highly profitable businesses with an opportunity to reinvest earnings at the same high rate benefit much more from NOL’s than their lower earning brethren. 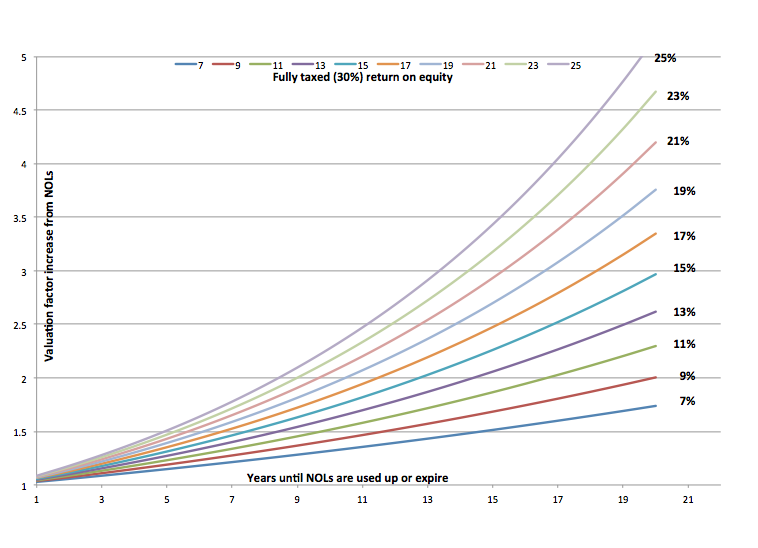 The chart below shows the markup factor as a function of after tax return on equity and the number of years before the NOL’s run out or expire. Avoiding taxes for 20 years rather dramatically increases the value of high return businesses. The 25% return on equity business, for example, becomes a 35.7% return on equity business and is worth more than 5 times as much as the identical but taxpaying counterpart. This is the miracle of compounding at work. I generally wouldn’t pay the premium prices for companies with NOL’s suggested by this chart, however. Using NOL’s comes with restrictions. The IRS will disallow NOL’s in the event of a change of control, so you can’t sell your microcap to someone bigger. The IRS will also find that a change of control has occurred if more than 50% of the shares change ownership in a three year period. Only 5% holders who must report holdings changes to the SEC count. The IRS doesn’t even know when we little guys buy and sell. You’ll often see poison pills that prevent acquisition of more than 5% of the shares without the permission of the board of directors. Asure Software (ASUR), Broadwind Energy (BWEN), Horizon Lines (HRZL), and Kingsway Financial (KFS) are a few microcap examples among many that have NOL preservation rights plans. I would also note that the value of NOL’s diminish or disappear if the company doesn’t hit the ROE’s you expect. NOL’s are an intangible tax asset. If the companies forecasts future profitability a “deferred tax asset” will appear on the balance sheet to reflect the value of the NOL’s. But it’s very high risk to pay the high valuation multiples from NOL’s suggested by the plots above. If future earnings aren’t what you expect the deferred tax assets must be reduced by the accountants but worse the tax benefit you counted on is reduced too. In the worst case, NOL’s become totally worthless if you stop making money. Of course it can work the other way too. If the company is more profitable than you projected the NOL’s may be worth more too. Of course, managers of companies with NOL’s are well aware of arithmetic and will try to take advantage. Asure Software, for example, has large NOL’s. They’ve made four acquisitions in the last three years financed mostly by debt (to boost ROE) and the stock has tripled. Kingsway Financial has also made three acquisitions in just the last year and intends to issue preferred stock to continue to acquire and grow. This is frequently the strategy; grow quickly using debt to maximize the value of your NOL’s. Acquisition strategies are notorious for destroying shareholder value but the strategy can actually make sense for a company with NOLs. Every time a company with NOL’s buys a profitable company everyone is happy. The target company shareholders probably get a premium price, the acquirer gets a company worth more to them than to the seller, and the IRS gets screwed! So companies with tax NOL’s have a serious competitive advantage. A rather ordinary 10% ROE business becomes a valuable 14% ROE business. Should you just go buy up all the companies that have lost a lot of money? I’m not keen on owning loser companies but if something has happened to change the fortunes of the company going forward then I’m interested. I own Asure software, for example, which lost money in the videoconferencing and patent troll business but now is a cloud software company aimed at the growing mobile workforce market. The new management is first rate and might get onto the 19% ROE curve that gets boosted to 27% with their NOL’s. Those NOL’s should last 10 years. Consulting the chart, the company’s money-losing history roughly doubles the value of the company. Most microcap investors were well aware before reading this article that NOL’s are an asset. My hope is that some readers may now realize what a tremendous asset they can be especially for a highly profitable growth company that can reinvest earnings at a high rate. Highly profitable companies with a long history of big losses are rare. Hedge fund managers are attracted to them. Often times activists are trying to create them. When you come across one, you should consider the advantages of the NOL’s. And finally, if you find one you like, tell your friends at MicroCapClub about them! Mark, good post on a very interesting topic. In the micro cap space we are sure used to Net Operating Losses, but you’ve outlined circumstances where they may be very useful in valuing a company. Mark, as iron sharpens iron, your write up is enlightening. Thank you! I have learned to look at NOL differently and more clearly thanks to your teaching. I am going to reread your article constantly to get it embedded in my memory. I have a new mental model “NOL”. MMAC is a MicroCap with $420,000,000 in Nol’s and is currently now profitable.